Today's custom wallpaper entry takes us to the dark side, where things go bump in the night and danger lurks 'round every corner. 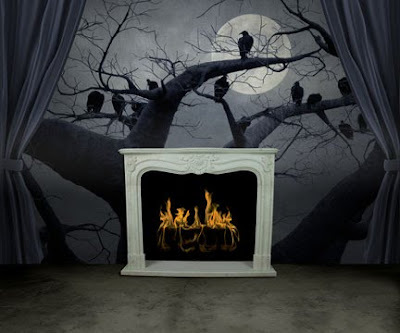 Or, look at our vampire-inspired custom wallpaper installation another way, as pure aesthetic enjoyment; which is the current attitude about vampires and other fanged creatures of the night. You see, growing up Vampires used to be terrifying. Images from Nosferatu and Béla Lugosi portraying Dracula were dark, ominous, and patently unattractive. Cue today's new crop of Vampires that are decidedly more Hollywood: young and attractive, free of the less savory trappings of blood suckers of yore. That's fine by us, From Twilight to HBO's True Blood, Vampire related imagery has been become an appealing source for custom wallpaper. For those of you that think this may be just like Halloween everyday in your home, you're partially right. If you want an overtly ominous design like the wall mural in the inspiration room above, we can certainly achieve that. Or you could commission an original wallpaper design, perhaps a creepy old Victorian inspired blood red wallpaper, or a wallpaper pattern based on spider webs. With full design capabilities, we can help you achieve the undead look that you've been dying to have.